Pizza night takes on a new shape with these spicy pizza cups. Crisp tortillas are baked in muffin cups & made into mini pizzas with your favorite toppings. They make fun shaped easy appetizers for any gathering. There is nothing quite as much fun as a teenage girl’s slumber party. The hair, and make up and music and food…who can forget the food snacks that you will need to serve? These pizza cups have a spicy Mexican flavor that any party guests will love! If you are looking for 30 minute meals or appetizers, this one is quick, easy and super tasty. The kids will love these! They are sort of a pizza taco. Two great tastes in one neat recipe. Finding just the perfect late night snack for teens with the munchies is easy if you remember that they love food that is tasty and fun. These pizza cups are sure to add a sparkle to the late night snack fest. They are so easy to do. 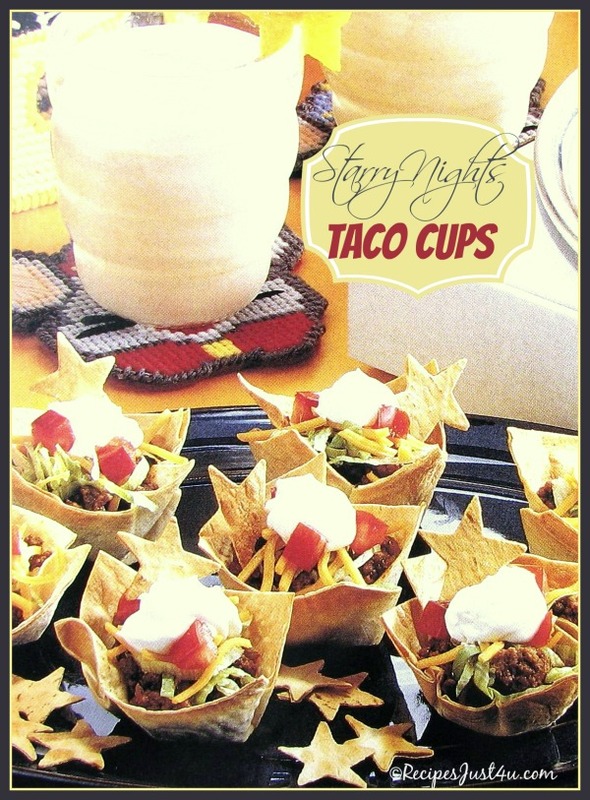 Just line muffin cups with tortilla shells and then fill them with a spicy taco mix that the girls can then garnish with their favorite toppings. The extra cut out stars add fun and whimsy to the dish and will delight the sleep over guest. Add a glass of milk and stand back while the girls devour them and think you are a genius! These fun shaped snacks are wonderful as an any time party appetizer. They are easy to hold and handle and great fun. Pizza night takes on a new shape with these spicy pizza cups. Crisp tortillas are baked in muffin cups & made into mini pizzas with your favorite toppings. In a non stick frying pan, brown the ground beef until it is no longer pink. Add the onion and cook until soft. Stir in the salsa, ketchup and seasonings. Heat through. Cut each tortilla into a four inch square. Be sure to keep the scraps to make the stars. Microwave 8 squares at a time for 20 seconds. Press them into the bottom and sides of greased muffin cups. Set these aside. Cut the scraps into stars with a 1 inch cookie cutter. Place on a greased baking sheet. Bake at 350ºF for 6 minutes till golden brown. Fill the tortilla cups with the meat mixture. Bake for 12-15 minutes. Serve with the toppings and garnish with the stars.